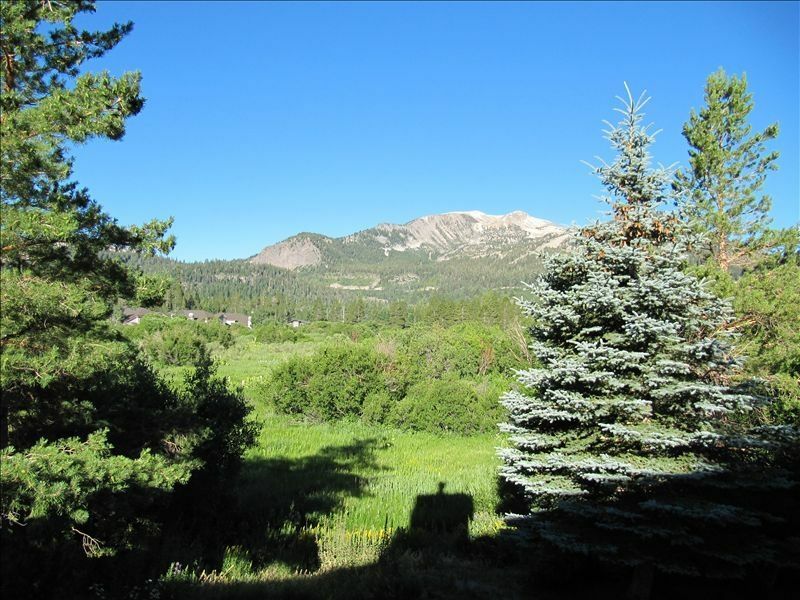 This unit sits on Snowcreek Meadow with an unobstructed view to Mammoth Mountain from both the living room and the master bedroom. Sleeps 4 in the loft, has a king bed in master bedroom, and a queen bed in second bedroom. The unit has been fully remodeled with new carpet, flooring, window coverings and upholstery. This is a very nice unit with the best view in Snowcreek. Fish in the creek steps from the door, bike throughout town via adjacent bike path, walk in the meadow, hike and bike on the mountains or ski from Eagle Lodge four minutes away. Walk to Snowcreek Athletic Club with full facilities, including; pool and tennis. Driving range and two golf courses are minutes away. Take Eagle's six man chair to Canyon Lodge area, Lincoln Mountain, or Eagle Bowl, as well as, all mountain access via the new Eagle Bowl high-speed lift. On busy winter days, this is the best way to get on and off the mountain. We are a Santa Barbara family. Love the outdoors both by the ocean and in the mountains. Mammoth has year round benefits for exploring and enjoying the high Sierra. We purchased in this location because the view is so fantastic. We get great afternoon sun and direct access year round to the open space of the meadow with its meandering creeks and views right up to Mammoth mountain and the high Sierra. This property is highly enjoyable year round. In the summer it feels like living in a park with greenery and direct mountain views in all directions. In minutes one can be up in the high sierra lakes and hiking country. In the winter it is cozy and has very easy access to the ski lifts, stores and restaurants. Parking is directly adjacent at the same level for easy loading of gear. Views from Living Room and Master Bedroom are directly to Mammoth Mountain. Please contact us by email for special rates and costing at different times of the year. Clean, great view of the beautiful meadow. Loved our stay! Great location in Snowcreek. Very clean. I'm so glad you enjoyed your stay. Come again anytime! We had a great time at Valerie's condo in Mammoth! The unit is large, super clean, and well appointed with plenty of room in both the bedrooms and common areas. Great wood-burning stove, huge loft, and incredible views. Would gladly stay here again! Thanks for the positive comments about your stay. I'm glad you had a good time in Mammoth! We celebrated our sons 16th birthday on the slopes and it was a blast! Not a ton of snow but they powered through anyway. Our family had a wonderful time at the condo! It was perfect for family meals, had everything I needed. The view from the balcony is so nice and relaxing. My husband and kids used the spa every night and loved it. Excellent location! Thank you for a wonderful stay, we will be back! A few friends and I decided last minute to take a trip up to Mammoth to enjoy the winter wonderland! Valerie was extremely helpful and responsive as soon as we put in our inquiry. The condo is gorgeous and spacious, with a great kitchen and welcoming vibe. The community hot tub and spa were perfect, to unwind after a long day on the slopes. The location is an easy walk from the shuttle line, which takes you right into the Village and runs every 20 minutes. I would absolutely recommend staying here and look forward to heading back up myself! Booked this place with 1 day notice. Perfect for a few colleagues who wanted decent space and a reasonable price. Has a great kitchen and common room setup, fun for cooking and hanging post a ski day. Great communication from owner, really appreciated the help to make it happen so last minute. Definitely recommend this place! My friends and I have been trying and trying to find the time and location for a small group vacation. Celebrating NYE in Mammoth and particularly this condo was the perfect setting for a mini- vacation/reunion of old friends. The condo was easy to find, well maintained, clean, extremely spacious, had all the amenities, very short drive to the Village and town (literally only 5 min drive, in snow chains), short walk to the shuttles, close to the Jacuzzi. I don't think I could have picked a better place to stay. Valerie (the owner) was very helpful and prompt with all my emails and texts. I know for a fact, that I will be contacting her again for my future trips to Mammoth. Our unit is on Fascination out on the Meadow. Great view to Mammoth Mountain and the Sherwins. Rates are subject to change during peak holiday seasons. Please inquire of the owner.